My reset button has been pressed thanks to a wonderful camping trip. I had an awesome (read relaxing) time, as did Greg. The people were nice, the lake was beautiful, the sun was shining, the food was tasty and the beer was flowing. Can it get any better? I think I slept better in the sleeping bag on an air mattress than I have on my mattress at home. I was even contemplating moving somewhere where we could live outside with our tent and camping gear. I can’t lie, I still am but we have over a year on our lease and need to decide where that place might be. Anyway, if we are lucky enough to be invited back next year, I will cook more things in my dutch oven for a large crowd-promised. I will gather more dutch ovens for this feat if necessary. I made a few friends, I think, mostly in the form of dog. I love animals, especially dogs and there were at least 8 roaming around in “happy dog land.” Below is one of my buddies, Malcolm, a beautiful sheep dog. Otherwise, bean bags were tossed left and right for the tournament and alcohol was consumed vigorously by most. (Our friend Josh and his partner Kate won!) There’s always next time, Bill and Kim. Well, their first child is on his way this winter so who knows. They can play some mean bean bags though. There was a lot of talent on the small island. Of course I had some smores over the Saturday night fire. (You’re killing me, Smalls! 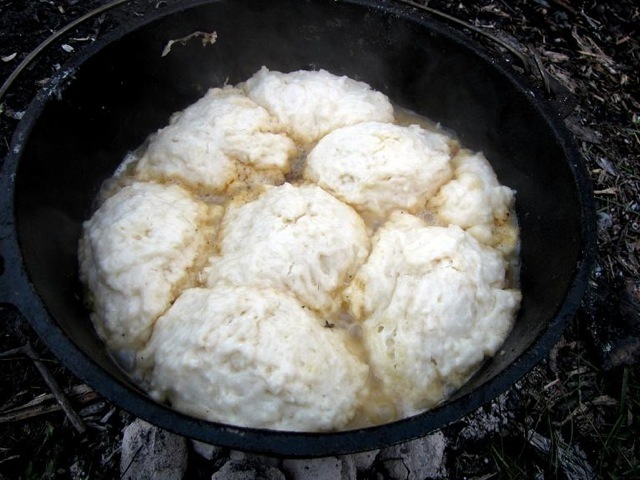 Movie reference: the Sandlot) I made chicken and dumplings to share but it took quite a bit of time to heat the dutch oven over the briquettes but was worth the wait. I will definitely make this again. Before we headed north, I created this recipe for the weekend and am pleased to pass it along. You can make this on your stove; a campfire is not required although I highly recommend trying it if/when you camp next. If camping: Heat 20 briquettes in campfire and remove 14, leaving the other 6 in the fire, place them on the side away from the fire. Place dutch oven (lid on and pre-seasoned) over those 14 to begin heating. Add canola oil after 30 minutes or so, then butter. When you see bubbles, add onion, celery, carrot, shallot, salt/pepper, herbs of choice and cayenne. When they begin to soften, add a small amount of broth, mix and place the lid on top for 10-15 minutes or until veggies are soft. Add the chicken and enough chicken broth to cover. I added more briquettes to the bottom and a few on the lid at this point to really heat things up. Allow this to reduce a bit and heat the chicken, then you might need to add some flour to thicken, stirring it in the entire time. Make dumplings in a bowl until you have a chunky mix and plop them over the chicken mix, 6 to 8 dumplings. Place lid back on and cook 10-15 minutes or until the dough is cooked through. Ta-da! Not camping: Heat dutch oven over medium heat and add oil, a few minutes later add veggies, butter, herbs, cayenne and salt/pepper. Cook until veggies are soft, then add some broth and reduce 5 or so minutes. Toss in the chicken pieces and more broth, just to cover the chicken and place lid on for about 5-10 minutes. Stir in flour to thicken and make dumpling mix. Plop the dumplings, 6 to 8 on the mix and cover again for 15-20 minutes or until the dough is cooked through.